When you're transporting your children, you want them to be as safe as possible. We'll spend hundreds of dollars on the best, top-of-the-line car seats just to keep our kids safe. However, it's reported that nearly 73% of car seats aren't installed properly. We have some great safety tips that you and your family can follow to make sure your little one's car seat is as safe as possible. Don't forget to check out our page about choosing the right car seat for your child. Register – Make sure you fill out and send in the registration card that comes with your car seat. This will keep you informed of any recalls or manufacturer defects that could be discovered later on. 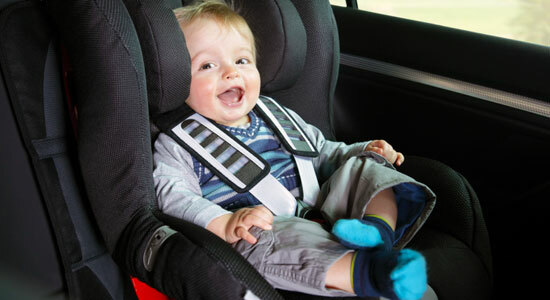 Some car seats can be registered online. Damaged Seats – If you have an old car seat – one that was involved in an accident before – you could be using a damaged seat for your child. A broken car seat can cause serious injury in the event of an accident. Never reuse a car seat that was in a previous wreck. Beware of Second-Hand Seats – Make sure to research any seat you didn't buy first-hand. There may be recalls on older seats that you purchased at consignment shops, the Goodwill, or received as hand-me-downs. Avoid the Front Seat – The back seat is always the safest place for children 12 and under. The airbags in the front can cause serious injury to kids in car seats or who aren't big enough to ride up front. Safe and Secured – No matter the distance, make sure your child is securely fastened into their seat. Most accidents happen close to home. Whether it's 1 mile or 100 miles, make sure they're snug in the seat. Read the Instructions – Not just for the car seat, but read your car's manual as well. There could be important information about securing a car seat included from your car's manufacturer. Can't Quite Get It? – Take a ride, without your child in the seat, to your local fire department, police station, or car dealership, and they will check the car seat for you. Find the Right Fit – Make sure the seat fits your child and your vehicle. Buying a car seat that's easy to use safely every time is a must. Less than 40 lbs.? – Remember, if your child weighs less than 40 lbs., they shouldn't be riding in a booster seat. Keep it Cool – Never leave your child alone in the car, especially if it's hot. Don't be tempted to run into the store without them. Your car's temperature can rise 20 degrees in a very short amount of time, leading to heatstroke or even death. For more information, check out our car seat infographic to keep your children safe and secured the next time you hit the road. Product defects can cause serious, life-changing injuries. We can help if your loved one has been injured from a faulty car seat. Contact our legal professionals at 1-866-943-3427 or simply complete the form in the top right corner of this page. With our law firm, there's absolutely no fee unless – or until – we win your product injury case. We'll fight to recover the maximum amount of money for your loved ones, and we'll help you plan for future medical costs. Don't hesitate. Call our experienced legal professionals today.